The dog days of summer are here in the Northeast and it. is. sweaty. I'm hankering for things that are raw or minimally cooked, so a sheet pan dinner may seem counterintuitive. But the cooking here is very quick, requires very few dishes, and the end product leaves us feeling satisfied, but not stupified because being really hot and really full is like entering the third ring of hell. 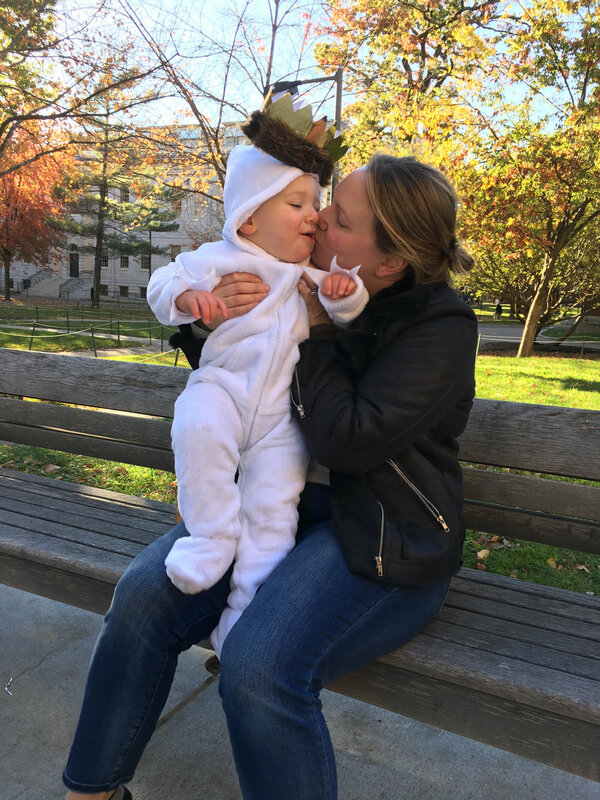 Speaking of hell (KIDDING), we're in that annoying place where the things our kid does seem SO AWFUL to us, but when I tell others about his behavior, I'm usually met with, "Yeah, that sounds about right for a 3-year-old." For instance, I just about blacked out with rage (though I think I handled it okay), when M aimed his stream directly at the back of the toilet instead of into the bowl, effectively spraying our entire bathroom with pee. He thought this was HILARIOUS, while I floated out of my body and burst into a million pieces. The first person I told about this replied, "If he ever has a brother, they'll probably do it together." Don't get me wrong, it's VERY comforting when other people are completely unfazed by M's behavior. But I'm still left wondering if I'm the world's least effective parent. It can be hard to process. But I also get it. When I tell someone else about M's behavior that's driving me crazy, to them, it's an isolated incident. But when I'm asking him to put on his shoes for the 20th time after struggling to get him to do five other things in the past hour, that shoe battle feels so much more intense and difficult. Basically what I'm saying is that 3 has been a tough age so far and that on exhausting days, the last thing I want to do is fight with dinner too (what a segue, huh?). This dinner is partly steamed and partly roasted. Roasting the fish with the veggies proved counterproductive because a lot of liquid came out of the fish while it cooked, which led to steamed veggies instead of roasted ones. No thanks. So! Wrap up the fish and let it steam in the citrus. 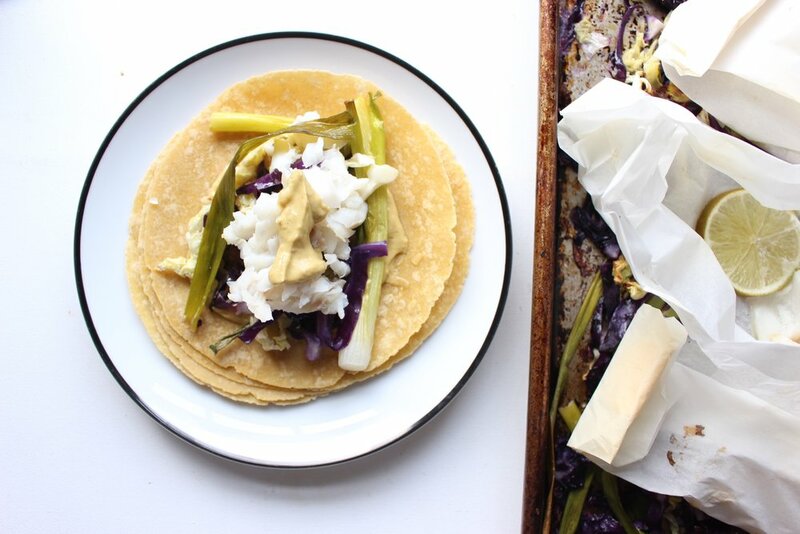 Chop the cabbage and scallions, toss with some olive oil, and throw the whole mess into the oven. 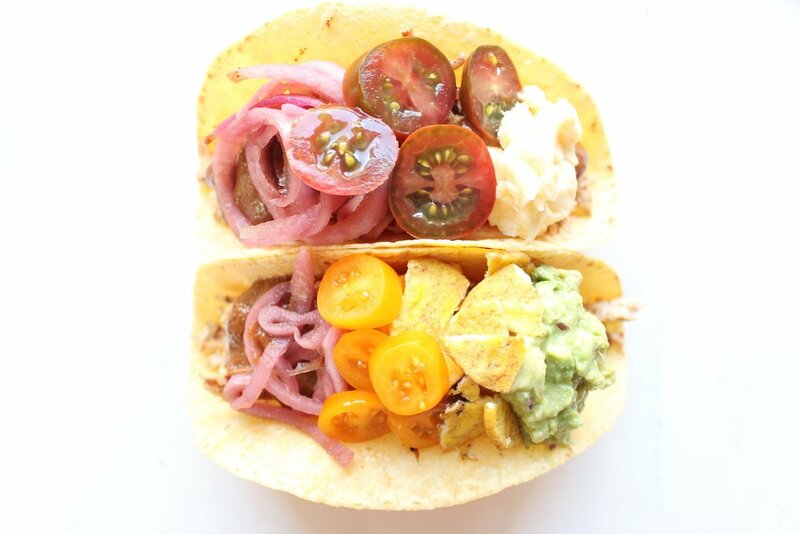 While it's cooking, heat some taco shells, whizz some avocado crema in the blender, and prep any other toppings you might want (cheese, tomatoes, jicama, beans, etc). Tonight's dinner can be ready in about 30 minutes and is a nice departure from the usual taco night. 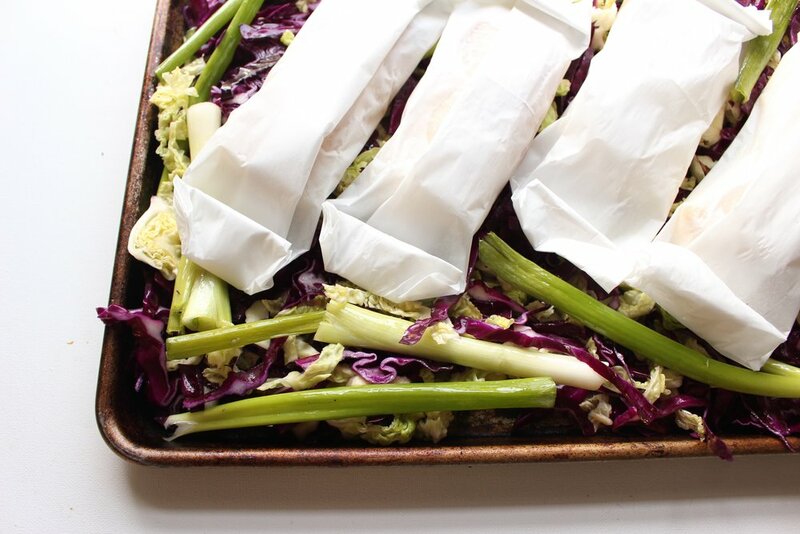 Toss the cabbage and scallions with 2 Tbsp of olive oil and salt and spread onto a baking sheet. Set aside. Slice the lemon and one of the limes. Spread out four sheets of parchment paper or tin foil on your countertop. 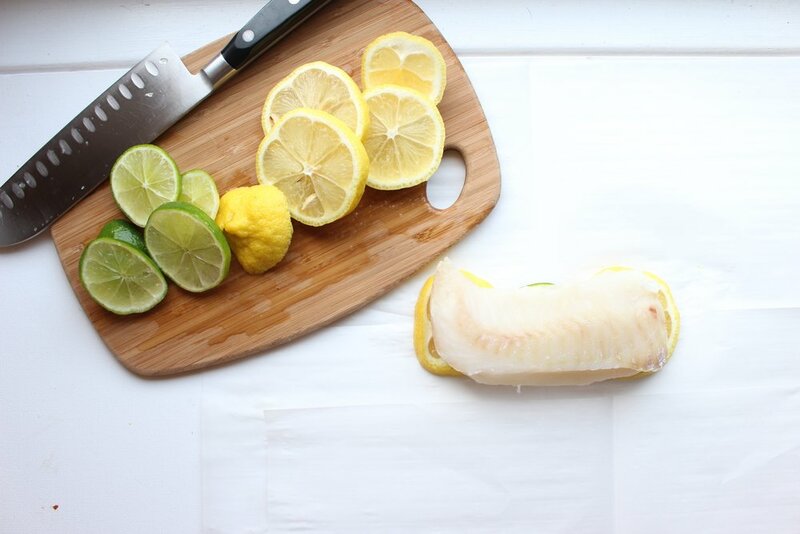 Place 2 or 3 slices of the lemon and lime in the middle of the parchment. Place one fish filet onto the citrus bed and sprinkle with salt and pepper. 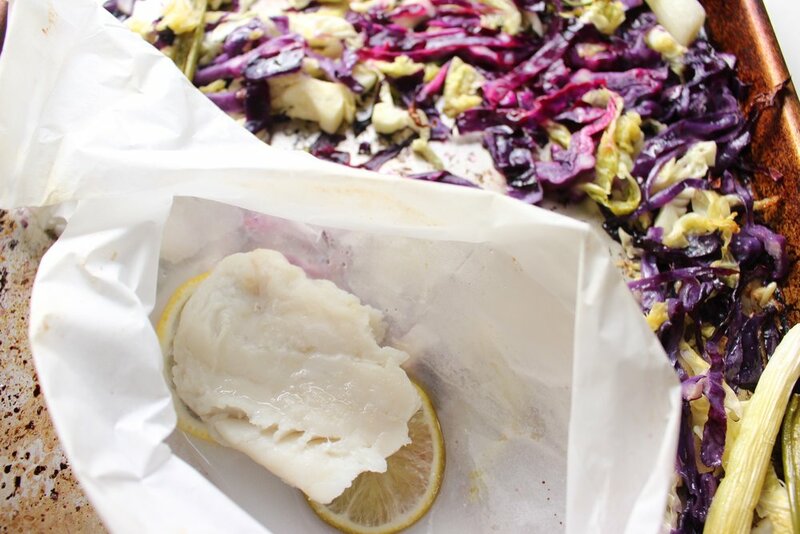 To fold the bundles, bring the edges of the two longest sides of the parchment together and fold over three or four times until you can’t fold anymore without hitting the fish inside. Next, fold the sides toward the middle until you’ve made a tight rectangle around the fish. Place on top of the veggies, making sure to move the scallions out from beneath the fish and toward the edges of the sheet pan. Roast until the veggies are wilted and lightly browned and the fish flakes easily with a fork, about 15 minutes. If desired, carefully remove the fish bundles, being aware of steam that might escape, and roast the veggies for another 5 minutes. Meanwhile, make the chipotle avocado crema. Combine the mayo, avocado, lime juice, water, garlic, chipotles or hot sauce, and salt in a blender or food processor and blend until smooth. If too thick, scrape down the sides and add more water a little bit at a time and blend again until you've reached the right consistency. 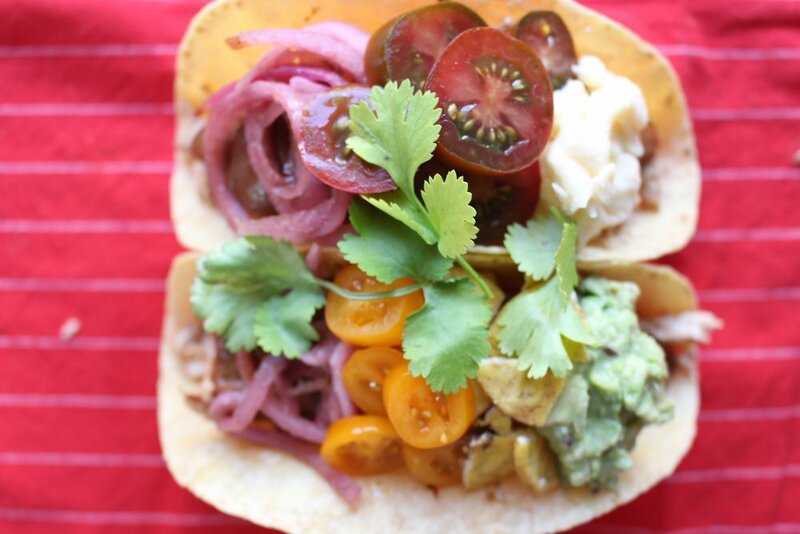 Toast the corn tortillas and prep any other fixings you might want with your tacos (cheese, more avocado, beans, tomatoes, etc). Squeeze some more lime juice over the assembled tortillas and serve. That's right. Mole. In an instant pot. Now, hear me out. I don't claim that this mole is in ANY WAY authentic, but what is an authentic mole anyway? 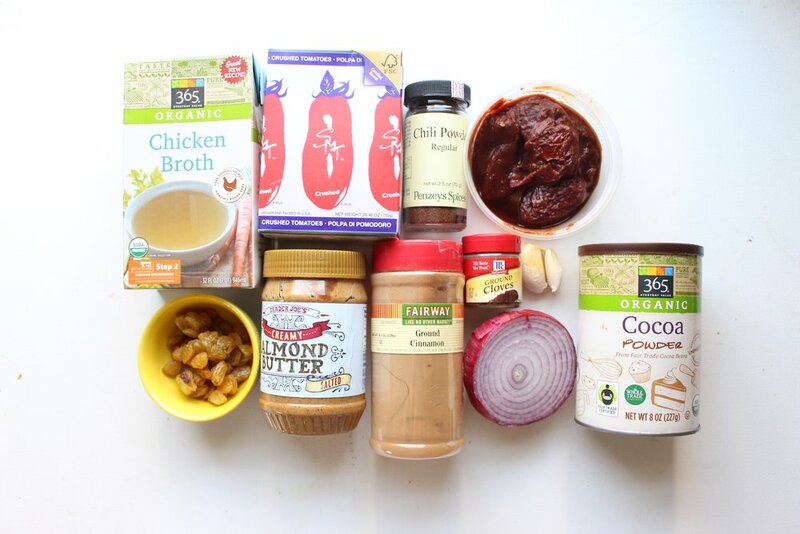 It seems to me that there are characteristics that qualify a sauce as mole, but that there is no one recipe to rule them all. Now, I also realize that this dish is usually made with a huge list of spices and chiles, most of which you have to toast or hydrate, and that traditionally, these spices are ground by hand with a mortar and pestle. But, WHO HAS THAT KIND OF TIME? Surely not parents of toddlers. Instead, you can toss everything into an instant pot and have a really complex dinner on the table in about an hour (with most of that time being hands off). The most time consuming part of the process here is reducing the sauce after the chicken has been pressure cooked. You'll want to saute the liquid until it reduces by about half and when you scrape the bottom of the pot, the sauce doesn't re-cover the metal right away. That will be a good indication that the sauce is thick enough. The sauce after being reduced. See how the sauce doesn't cover the metal right away? 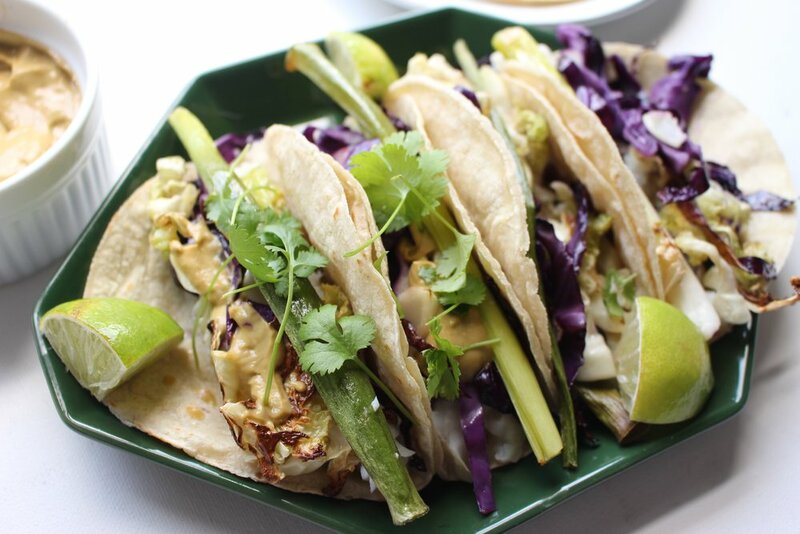 This dish is great over white rice, brown rice, cauliflower rice, in a taco, in a lettuce cup: you get the picture. The ingredients all comply with Whole 30, which means it's gluten, dairy, and refined-sugar free. You can also swap in seed butter for the almond butter if you need to avoid nuts. 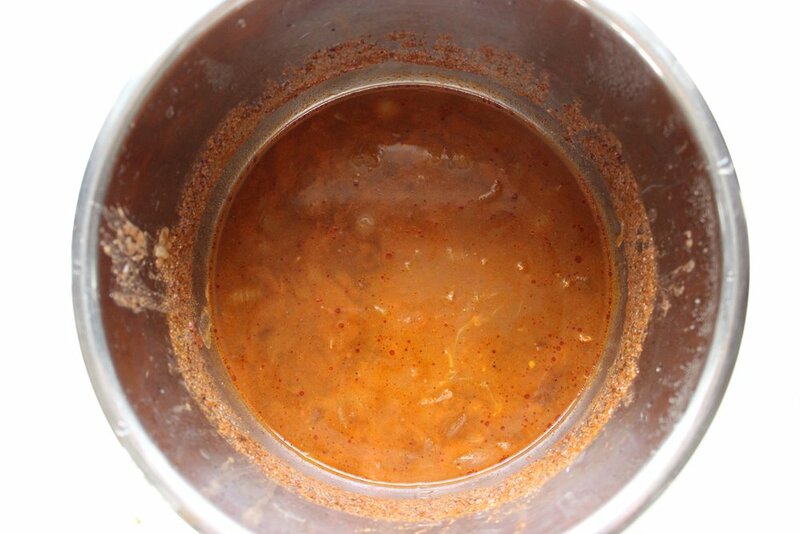 Place all of the sauce ingredients in your instant pot and whisk to combine. Add the chicken breasts and scrunch them around to make sure that there is liquid surrounding the pieces. Close the instant pot and cook on high pressure for 15 minutes. Release the steam manually and remove the chicken. Check the doneness of the chicken with a thermometer (it should read at least 165). Turn the Instant pot off and then back on with the sauté function on medium. Saute until the remaining liquid has reduced by half and thickened significantly, about 20 minutes (you should be able to scrape the bottom of the pot and see the metal for a second before the sauce covers over it). Let cool slightly. Add the liquid to a blender and blend until smooth. Serve the chicken with 1/4 of the sauce and any other garnishes and accessories that you want.